The Christine Car Club » Christine Car Club Tech Section » Body, Interior & Exterior Trim & Paint: » Driver quality grill. I had a grill that was in pretty bad shape yet I hated to just give up on it. I still have to pop rivit on two aluminum mounting tabs. This it a couple of tips for anyone who is looking to fix up a grill in rough shape for a driver quality grill if they can't afford the $$$$ to get it anodized. Clean the grill really good with degreaser soap and water. If there is ant rust on the mounting tabs steel wool it off. Run a scotch brite pad over the entire grill. The rust areas prime with Rustoleum rusty metal primer. Sprat grill with adhesion promoter. Rustoleum makes a wheel paint for aluminum wheels. It will take two cans to do the front two coats and the back. Paint the grill and let it dry. Just a little tip for those who have a grill in rough shape that can't afford to get it redone or to buy another one. Will make a nice driver quality grill. Very nice Jim. Excellent advice for those of us on a budget! Great advise Jim! 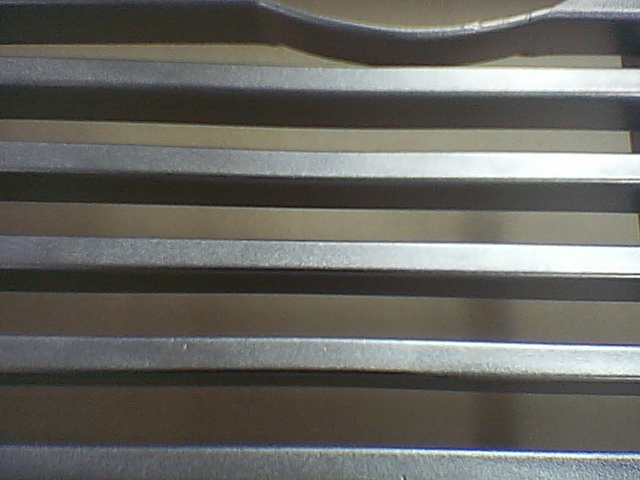 Also the movie used thin chrome sticker tape for the face of the grill that you would normanally see. Looks Great Jim Ive done same on previous projects and they look good,its not type of thing that will be noticed by 99% of folks excellent way to save cash and concentrate it on the more crucial parts of the build. Looks real nice Jim. ! Now that's good, clear, thinking! It came out great, Jim! If I bought a 57 Plymouth with this kind of front grill could I change it to a 58 grill? Sean, I believe '57 and '58 Plymouth's both have different grilles. Also they pretty much have a whole different front end. So if you are trying to make your '57 converted to a '58, you would have to get a '58 grille and put it on your '57. 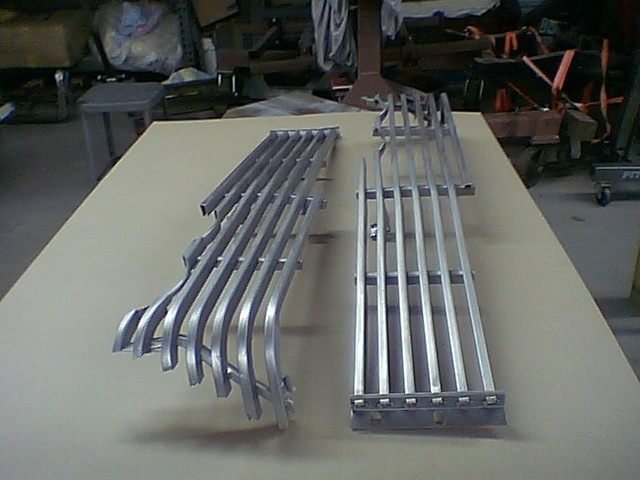 Along with a whole lot of other '58 front end pieces- such as: grille, lower grille, headlights, hood emblems. Then there is other pieces on the car as well: taillights, mirrors (interior/exterior), trunk emblems, side trim. Hope I helped you out here. Sean, Im sorry but I cant see the picture you posted. Maybe try again. But if your looking to put a 58 grill on a 57 the answer is it can be done. But it will require some modification. Its not just a bolt on type deal. You will need more then just the 58 grill. You will also need the dual headlight buckets that the 58 used. Plus the aluminum headlight eyebrows. And once you have those items there will still be the need to modify the front fender headlight bucket area on the 57 to except the 58 headlight buckets. While I haven't done this myself personally I have looked into it and I can tell you it will be some work to do this. So it all comes down to how bad do you want the 58 look. There is a thread on the old CCC site that details converting the 57 fenders to accepting the 58 headlight buckets. It a bit of work. I stayed with the 57 look on mine. Well Sean, Good luck my friend with whatever you decide to do. I don't want to discourage you from trying it. Its just not a bolt on type deal.